The Mushroom World is in peril! Bowser has sent the seven Koopa Kids to the seven kingdoms to transform the Kings into animals. Mario and Luigi set out to return the Kings to normal. Mario and Luigi have a whole new set of skills and power-ups to help them clear each stage. 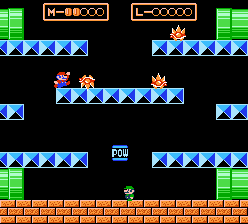 The Super Mushroom, Fire Flower and Starman return, and are joined by the Super Leaf which allows Mario to fly through each stage, as well as the Frog, Tanooki and Hammer Bros. Suits for even more special abilities. 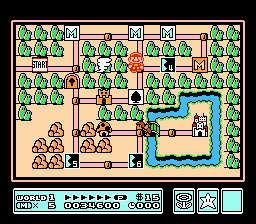 The levels have many hidden areas to explore, and you can find Mushroom Houses and bonus games on the map screen where you can win extra lives and items. When you find one of the secret Warp Whistles, use it on the map screen and it will play a tune and summon a whirlwind to take you to Warp Zone. Both the tune and the act of summoning a whirlwind with the flute are taken from The Legend of Zelda (NES 1986). When playing the 2-Player game, each player can challenge the other player by selecting their M or L icon on the map screen. 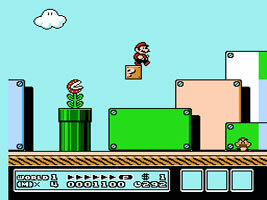 The minigame is based on the Mario Bros. arcade game. Players can race to 5 Coins to play the next round, and steal each others' Goal Cards. The music that plays when you use the Music Box item on the map screen is a lullaby version of the Super Mario Bros. theme. In Toad's card-matching minigame, the cards feature an Ace of Spades with "N" on the back. These cards are based on actual playing cards manufactured by Nintendo when they were predominantly a playing card manufacturer.